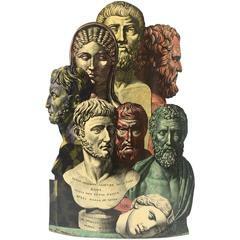 Offered for sale is an early Piero Fornasetti (Italian, 1913–1988) Teste antiche umbrella stand, circa 1950-1959, signed twice and numbered 11/90. The technique used to create this is lithographically-decorated metal. The piece is signed lower right and retains the Fornasetti Milano sticker on the back. Also has its' original liner/tray. The piece is in like new condition with minor wear only at the bottom end. Offered for sale is a rustic and weathered carved tree trunk that appears to be palm wood. It can be used as a vase, umbrella stand or vessel. 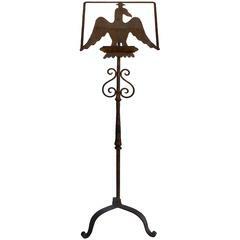 A classic example by Fornasetti umbrella stand. 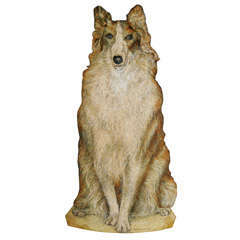 A Piero Fornasetti "Cateve" umbrella stand. Lithographically printed and hand coloured metal and brass depicting gold chains against a cream background. Marked Fornasetti to base. 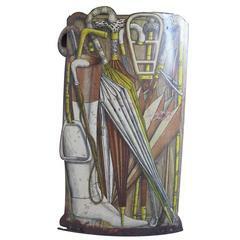 Rare umbrella stand by Piero Fornasetti (1913-1988), Italian designer known for his whimsical trompe l'oeil works on metal. This is an early example, circa 1950s-1960s.